This month, our Sales Manager David Wilson is off on an adventure down under! David will be joining Partech Instrument distributor Fluidquip Australia in Bendigo for the Water Industry Operators Association of Australia (WIOA) tradeshow—the largest in the country! The 2nd and 3rd of September will see the WIOA’s 78th Annual Victorian Water Industry Operations Conference and Exhibition take place, where lots of industry experts and water lovers will be gathered to discuss all things water related. 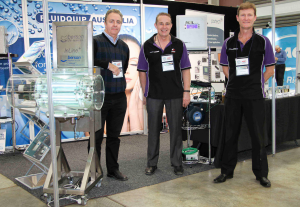 Last year David visited the WIOA tradeshow with Fluidquip Australia and together they managed to win the title of ‘Best Trade Display’ out of 200 exhibitors! This year they’re aiming to be awarded that title again, we’ve got our fingers crossed for them! However, David will say goodbye to Fluidquip and Australia to travel over to New Zealand and visit another Partech Instrument distributor, Instramatics. David will also be going to visit some water companies in Auckland and Wellington before bidding the antipodean nations goodbye!